Mirror Neurons: The Arena of Shen and Hun? 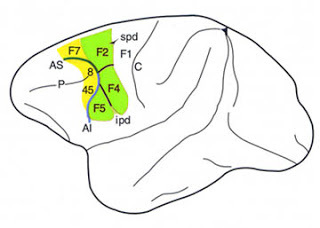 Area F5 contains millions of neurons that specialize in coding for one specific motor behaviour: actions of the hand, including grasping, holding, tearing and, most important, bringing objects (food) to the mouth. 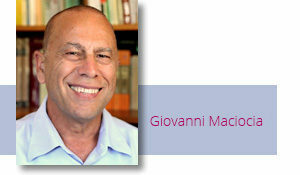 As Iacoboni explains “For every macaque these actions are as basic and essential as they come. We Homo Sapiens are grasping and manipulating objects from the moment we fumble for the snooze button in the morning until we adjust our pillows at bedtime. All in all, we perform hundreds, if not thousands, of grasping actions every day.”1 That it why the Rizzolati team chose area F5 for close investigation. One day the neurophysiologist Vittorio Gallese was moving around the lab during a lull. A monkey was sitting quietly in the chair; suddenly as Vittorio reached for something, he heard a burst of activity from the computer that was connected to the electrodes surgically implanted in the monkey’s brain. To an experienced neurophysiologist, this signalled a discharge from the pertinent cells in area F5. Vittorio immediately thought that this was strange as the monkey was sitting quietly not grasping anything, yet the neurons affiliated with the grasping action had fired nevertheless. Through many other painstaking experiments, the neurophysiologist came to the discovery that, within the F5 motor area, there are dedicated neurons (about 20%) that fire not when one performs an action but when one watches someone else performing an action e.g. grasping, bringing objects (usually food) to the mouth, kicking a ball, playing tennis, etc. They even fire when one simply hears a word such as “kick”. Mirror neurons imitating a grasping action fire even when the object grasped is hidden from view (behind a screen), but not if the monkey knows that there is no object. Crucially, mirror neurons are involved in predicting the meaning of a certain action: this is essential in communicating and relating to others. Iacoboni says: “The action recognition process implemented [by the mirror neurons] is some sort of simulation or internal imitation of the observed action. Given that our own actions are almost invariably associated with specific intentions, the activation in my brain of the same neurons I use to perform my own actions may also allow me to understand the intentions of other people.”2 For example, if I watch someone grasping a cup soon after having an argument with that person, thanks to the mirror neurons, I know whether he or she is grasping the cup to get a drink or whether they are about to throw the cup at me. Quiet simply, mirror neurons differentiate between the same action associated with different intentions. Essential to this empathy based on mirror neurons are other people’s facial expressions that trigger the firing of our mirror neurons. To James (of the James-Lange theory of emotions), this phenomenon means that “our mental life is knit up with our corporeal frame, in the strictest sense of the term.”4 Incidentally, that is the connection between emotions and the Po in Chinese medicine. Mirror neurons also play a role in the development of a sense of self. Social context is critical in developing a sense of self. Isolation seems to inhibit the ability to develop a sense of self; rich social context facilitates it. The presence of others, the continuous relations and interactions one must have with others facilitates the development of our sense of self. Mirror neurons fire when we observe actions and when we perform those same actions. There is a strong link between social environment and a sense of self and this link is at least partly due to mirror neurons. What has all this to do with Chinese medicine and, in particular, with Shen and Hun? I think there are interesting connections between the role of Shen and Hun and mirror neurons. Shen and Hun together are responsible for emotional empathy and relating to others. 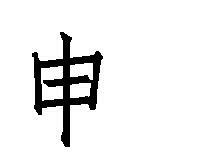 Consider the Chinese ideogram for “shen”. 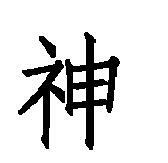 The right side of the ideogram is very interesting: it is pronounced “shen” and it means “to express, to explain, to stretch, to extend“. The last two meanings, “to stretch” and “to extend”, are crucial to an understanding of what the Shen does. It is responsible for “extending” towards others, for connecting with others, for emotional connection and empathy. In other words, for the function of the mirror neurons. How does the Hun help the Shen? The Hun is responsible for a different type of consciousness than that of the Shen. It is responsible for intuition, planning, life dreams, ideas, inspiration and, incidentally, also artistic inspiration. How does the Hun perform these functions? Through its movement: the Hun is always moving in the sense of searching, exploring ideas, nurturing life dreams, etc. Without the input of the Hun the Shen would be an inert consciousness. The input of the Hun is therefore essential for the Shen to perform its function of relating and connectedness with others. Again, this is the Chinese medicine equivalent of the function of mirror neurons. The movement of the Hun has to be just “right”, not too much, not too little. If the movement of the Hun is deficient, the person may become depressed; if the movement of the Hun is excessive, the person may be slightly “manic”. I relate autism in children to a deficient movement of the Hun that leads to an impaired function of the Shen in relating to others. As we have seen, this has been related to a dysfunction of mirror neurons. How does one stimulate the movement of the Hun? I use the Gall-Bladder channel and especially GB-40 Qiuxu. To restrain the movement of the Hun, I use LIV-3 Taichong. Other points that regulate the Shen and Hun and Du-24 Shenting and GB-13 Benshen. 1. Iacoboni M, Mirroring People, Picador, New York, 2009, p. 10. 4. Calhoun C, Solomon R, What is an Emotion?, Oxford University Press, 1984, p. 125. 5. Iacoboni, Mirroring People, p. 175. The left part of the ideogram (by itself pronounced shi) indicates something spiritual, it evokes heaven and stars, also an ancient altar for sacrifices, signs from Heaven. I like the word “numinous” in relation to this quality of Shen.